More than 300 coats were donated to ensure children in the Roosevelt School District stay warm during this winter season. Pictured are Dr. Marnie Hazelton, Supt. Of Roosevelt UFSD, Legislator Kevan Abrahams, and John Wighaus President of the Nassau County Detective Association. Roosevelt, NY - November 15, 2018 - Legislator Kevan M. Abrahams (D - Freeport) participated in Nassau County Detective Charitable Foundation annual “Coats for Kids” drive at Roosevelt High School on Friday, Nov. 9th. 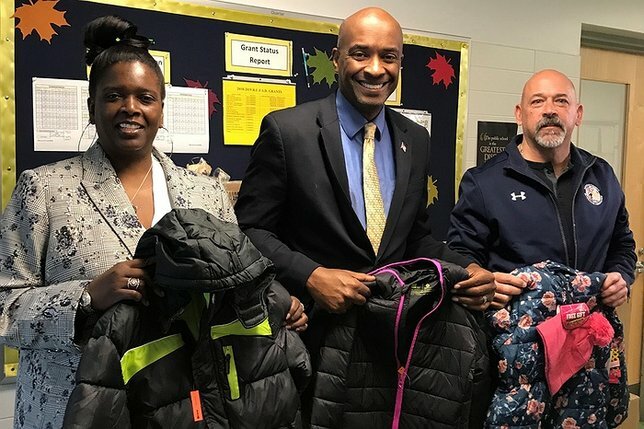 More than 300 coats were donated by Nassau County Detectives Association to ensure children in the Roosevelt School District stay warm during this winter season. The coats will be given to children in Roosevelt’s Elementary and Middle Schools. “The partnership between public safety and the district is critical in establishing healthy, lasting community relationships. The donation of winter coats by the Detectives Association to the children of Roosevelt UFSD speaks to the high moral and ethical standards that we all should aspire to have. Contributing to the health and well-being of children is the least that we can do, and we are tremendously grateful for Legislator Abrahams’ donation as well,” said Dr. Marnie Hazelton, Roosevelt’s Superintendent of Schools. Subject: LongIsland.com - Your Name sent you Article details of "Legislator Kevan Abrahams Joins Nassau County Detectives Charitable Foundation Annual “Coats for Kids” Drive"